Welcome to Dimboola, a top spot to visit, a great place to stay. Dimboola is in the heart of wheat growing country. After many dry years, water came back to the Wimmera River and reached Dimboola at the end of September 2009. The water was a welcome sight for all the people visiting the town and the 2009 Dimboola regatta was a great success. The 123rd Dimboola Regatta took place on Saturday 13th November 2010. This was be followed by the Inaugural Head of the Wimmera on Sunday 14th November 2010. There regatta is always be plenty of fun for rowers, spectators and visitors to the town. After so many years of drought, the water came back to Dimboola in massive amounts in January 2011, with a huge flood. The Wimmera River continued to rise until the creeks on which the town was built overflowed around the town. Some houses were damaged, much of the surrounding farm land was flooded. Information about the flood at it's peak was broadcast on the ABC. The next performances of the play Dimboola presented by the Dimboola Performing Arts Group can by selecting the link to the Play "Dimboola". For bookings, phone Mensland Dimboola on (03)53891271. Getting to Dimboola is easy. Drive from Melbourne along the Western Highway through Ballarat, Ararat, Stawell, Horsham then on to Dimboola. From Adelaide drive through Murray Bridge, Keith and Bordertown, Kaniva, Nhill then continue on to Dimboola. From Adelaide catch the Greyhound, FireFly Express (two per day) or the V-Line bus each day or catch the Overland train on three days each week. 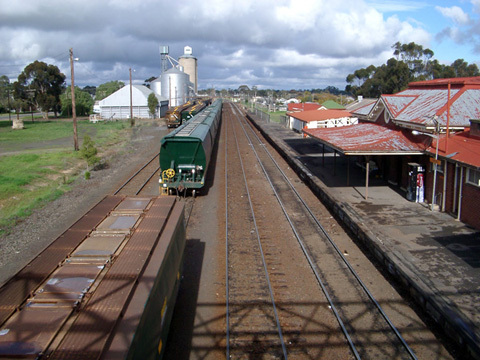 From Melbourne, catch the return services to Dimboola from the Southern Cross Station.